We’ve seen a few renders of the OnePlus 5, but actual photos have seemed hard to come by, at least until today, as two have just leaked out. The shots, shared by Priceraja, largely line up with those renders, showing a dual-lens camera on the back (albeit with the flash positioned differently to the renders), and an otherwise plain metal rear, with the OnePlus logo but none of the antenna bands you’ll find on the OnePlus 3T. 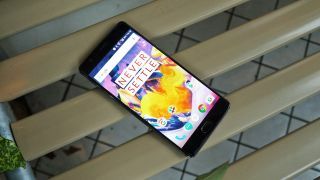 The design otherwise seems similar to the OnePlus 3T, but there’s one other change, as the OnePlus 5 shown in these photos doesn’t have a 3.5mm headphone port on the bottom edge. That suggests it has been ditched altogether – though it’s possible that the port has simply been moved to the top edge. In its place there’s an extra speaker grille flanking the USB-C port, which could mean the OnePlus 5 will offer superior sound, or it could just be for show. It’s too early to say whether these images are accurate. They mostly match up with renders of the phone, but the lack of antenna bands is surprising, since they’re usually necessary on metal handsets. Still, we should know the truth soon, as the OnePlus 5 is expected to land in June or July, with serious camera skills and a lot of power.